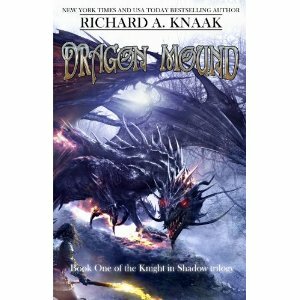 Review of the book, Dragon Mound by Richard A. Knaak. I normally like to write my own snippet about the book, but this book has so much going on it was a little overwhelming to me. I thought the synopsis from Amazon would work much better. That being said, this book was amazing. Even with the detailed plot, it was still easy to follow. The MC, Evan Wytherling, was a fascinating character shrouded in mystery from the moment we meet him. I was hooked trying to figure out what he was all about and what the details of his quest were all about. Mardi was also a great character. She wasn’t content with the life she had but she couldn’t put her finger on why until Evan showed up in her small town. It was fun to get to watch her grow and develop. I loved that the author, Knaak, would go back and forth between the two characters, in first person, so we could really get to know who they were. This is the first book in a trilogy and I thought the ending was perfect. It wrapped up some questions that were posed throughout the book while simultaneously leaving the reader with a hook that makes you crave the next book. I am very excited for the sequel to come out so I can devour it as well. I feel like I must put in a side note. This book is a little on the violent side but violence has never bothered me. The language is clean which is what I appreciated, I hate reading books that are filled with cursing. If violence doesn’t bother you and you enjoy a good fantasy, this book is right up your alley.